When you book a hotel online, you probably start the process on a comparison website like Priceline or Booking.com. And when you need to fly somewhere, Orbitz or Kayak may be your first stop to compare airfares. But where do you go when you are in the market to refinance your student loans, find student loans or get a personal loan? If you want to compare rates side-by-side as easily as you would compare flight or hotel prices, Credible is the place to go. Credible is a San Francisco venture-funded company that helps borrowers with student loans to get prequalified refinancing rates from different lenders without harming their credit. And since it began, Credible has expanded to compare not only student loan rates but also personal loan rates, and even credit cards. 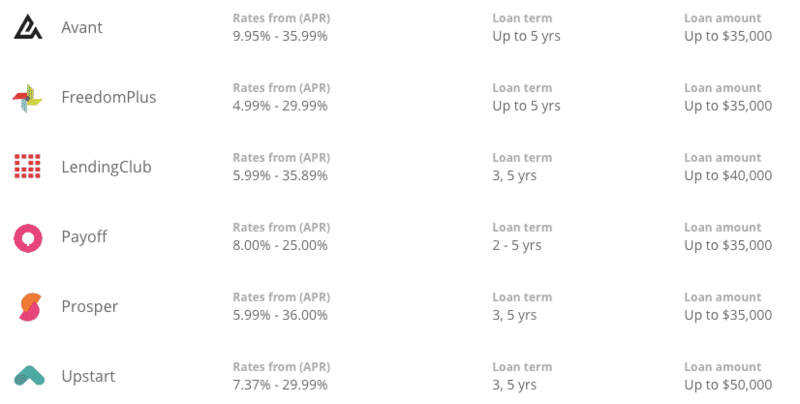 But before comparing loan rates what else do you need to know about Credible? We look under the hood in this Credible review. What Lenders Partner With Credible? What Interest Rates Can You Expect? Credible allows you to compare rates side-by-side, and it doesn’t hurt your credit score to view pre-qualified rates. Imagine for a moment how you would shop around for the best loan rates if you had to compare rates without the help of a loan comparison search engine. The likelihood is you would need to apply to a bunch of lenders and wait to hear back to learn if you were approved. And with each application, your credit score would probably suffer because hard credit checks would be performed by the lenders. By using Credible, you get to compare rates side-by-side to save you the hassle of individually checking the rates of each lender. Credible partners with the top credit bureaus, Experian, Equifax, and TransUnion, so it can pull a soft credit check that doesn’t hurt your credit score. You are pre-qualified for the rates displayed so it saves you time going through multiple approval processes with different lenders. Credible compares rates for student loans, refinanced student loans, and personal loans, and displays prequalified – not estimated – rates to borrowers. It also features a credit card comparison search engine to help users find the best cash back, travel, balance transfer, low interest, zero percent, secured, and student cards. 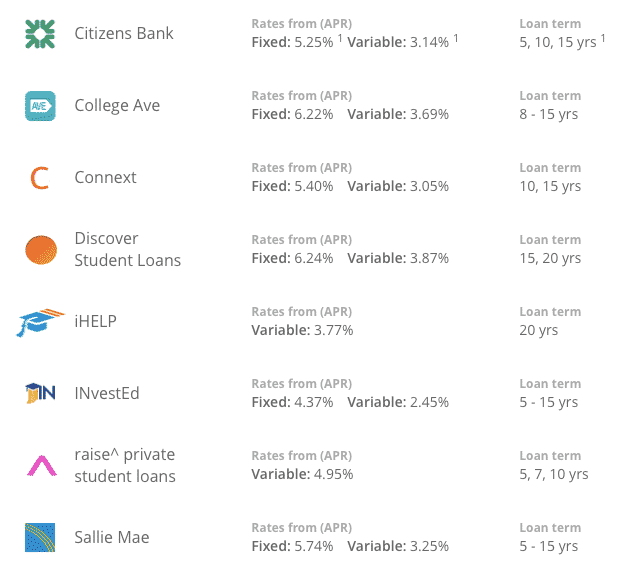 Credible lets you compare rates on fixed and variable student loans relating to over 2,200 schools. A primary reason to use Credible when comparing student loan rates is you receive actual rates not estimated rates. The process is free and Credible ensures you won’t get hit with origination fees or prepayment penalties. A sample of student loan issuers along with their rates and loan terms is listed below. As long as you have at least $5,000 in student loan debt and you are a U.S. citizen, you may be eligible for a refinanced student loan via Credible. Credible claims that the average user saves approximately $18,668 when refinancing through its partner lenders. Federal loans, private loans, and Parent PLUS loans are all eligible for comparison rate shopping. To get started, all you need to do is fill out a quick form specifying your school and field of study. Then you will be shown rates you prequalify for from various lenders which you can select. You can then import your loan information, answer a few questions about yourself and receive your finalized offer in as soon as 1 day. Personal loans are available from between $1,000 to $50,000 and can be used for a variety of purposes, including consolidating existing debt, renovating a home, financing a major purchase, or even starting a business. Credible shows you the rates that you pre-qualify for, however you are not obliged to follow through and actually take out a loan. And your credit score won’t be hurt by using Credible to check personal loan rates. Note that while origination fees are not charged on student loans they may be charged on personal loans. For example, we found origination fees as high as 8% from Upstart. Within about 2 minutes of starting the process, we were shown two loan offers for the maximum $50,000 we applied for based on a self-selected credit score of 750+. 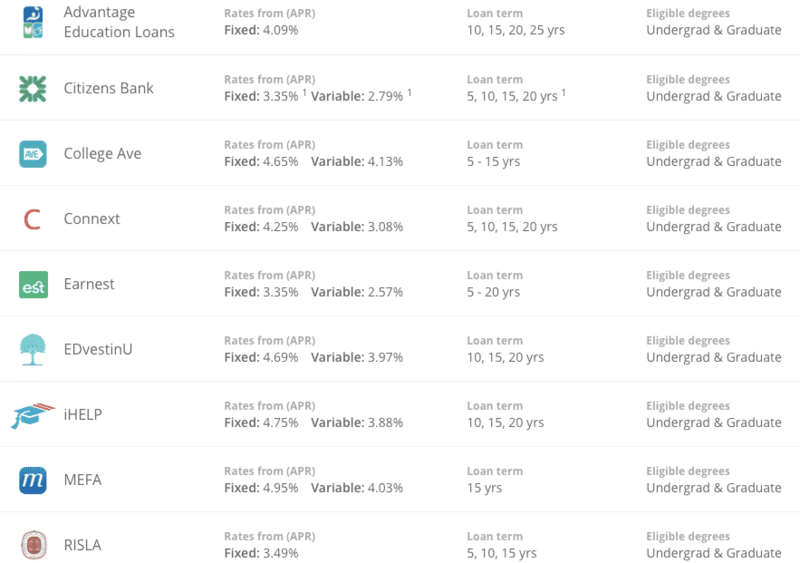 Eighteen other loan options were shown featuring a combination of different loan amounts and term lengths. In general, we found that the lower the loan amount, the higher the origination fees, which ranged from 4.87% → 8.00% in our sample set. Credible partners with a wide selection of partners but doesn’t feature all marketplace lenders. As good as Credible is at simplifying the process of rate shopping for student loans, refinancing student loans, and personal loans, it has one obvious drawback – it doesn’t partner with all lenders. During our Credible review, we noted a wide selection of lenders but also some notable exceptions in the form SoFi and CommonBond, which rank among the best student loan refinancing companies. Note: Credible does not charge its own fees on top of any charged by lenders. When you sign up for a loan with one of its partners, Credible makes money by earning a kickback from lenders when referring you as a customer. Credible allows borrowers to compare rates for student loans, student loan refis, and personal loans, but its marketplace does not feature all lenders in the marketplace. ✅ Free To Compare Rates: Credible makes it easy to compare rates for student loans, student loan refinancing, and personal loans – as well as credit cards. ❌ U.S. Citizens Only: International borrowers are not eligible for loans on the Credible platform. ✅ Soft Credit Check Only: Credible partners with 3 credit bureaus so only a soft credit check is performed that will not hurt your credit score. ❌ Not All Lenders Featured: The marketplace of lenders featured on Credible is extensive but not exhaustive. For a more thorough marketplace comparison, look to others such as SoFi and CommonBond too. ✅ Pre-Qualified Rates: Unlike some comparison websites that display estimates, Credible displays pre-qualified rates only. ✅ Fast Process: You will receive your rates upon completing the sign-up process and you can receive funding for some loans in as fast as 1 day. ✅ Credit Card Comparisons: Beyond student loans and student loan refinancing, you can compare credit cards across a wide variety of categories. ✅ Customer Support: Credible has top notch customer support available 7 days a week and even connects you to lenders via 3-way conversations if you wish. ✅ Better Business Bureau Rating: Credible earns an A+ rating from the Better Business Bureau and receives a 9.5 out of 10 rating on TrustPilot from consumer reviews. If you are concerned that you are paying too much interest on your student loans, or you are in the market for a new student loan, Credible is an excellent first stop to begin rate shopping. You can compare pre-qualified rates at no cost and with no hit to your credit score. The process from start to finish is quick, and funding can take place in as fast as one day. 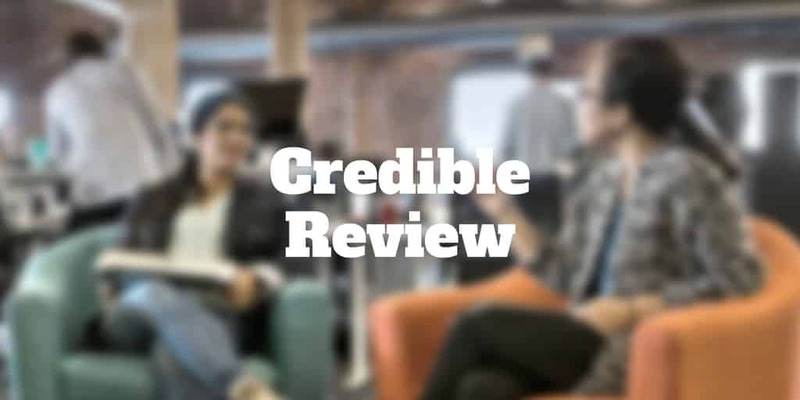 If any issues crop up along the way, Credible is known for providing excellent support every day of the week and earns top marks from TrustPilot and the Better Business Bureau. The biggest drawback is that Credible does not feature all lenders in the marketplace. Notable exceptions are SoFi and CommonBond, but overall Credible is a great first stop when you want to compare rates and can save you a lot of time and hassle that would otherwise be spent shopping around for the best lending rates. ‹ Get 30 Days Free At Tiller Money (Review) & Budget Smarter!